Goodreads: Born to slave-holding aristocracy in Richmond, Virginia, and educated by Northern Quakers, Elizabeth Van Lew was a paradox of her time. When her native state seceded in April 1861, Van Lew’s convictions compelled her to defy the new Confederate regime. 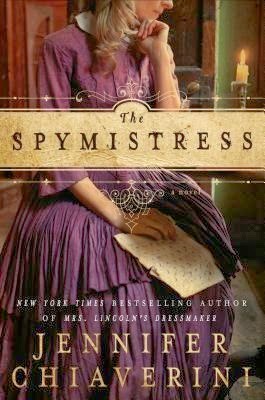 Pledging her loyalty to the Lincoln White House, her courage would never waver, even as her wartime actions threatened not only her reputation, but also her life. Although Van Lew was inducted posthumously into the Military Intelligence Hall of Fame, the astonishing scope of her achievements has never been widely known. Kritters Thoughts: An interesting new perspective on the Civil War through the eyes of a Unionist living deep within the Confederate lines and how she copes with living among friends, family and enemies. I was surprised that this book encompassed the entire Civil War, but in the end I was glad to read from the beginning to the end of the war. Lizzie Van Lew is VA born and bred and has no wish to leave the state, but thinks she may have to as the state secedes from the Union. She has slaves in her home, but only due to the complications from her father's will and her and her mother treat them more like family. The author did a great job of showing the many different ways that Lizzie Van Lew tried to help her side of the "cause." I absolutely adored this take on the Civil War because it made me think less about those actually fighting in the war, but instead about those who were at home keeping up the home front in different ways. I appreciated the author using a truly historical figure, but putting elements of fiction in as well. This books sounds right up my alley.